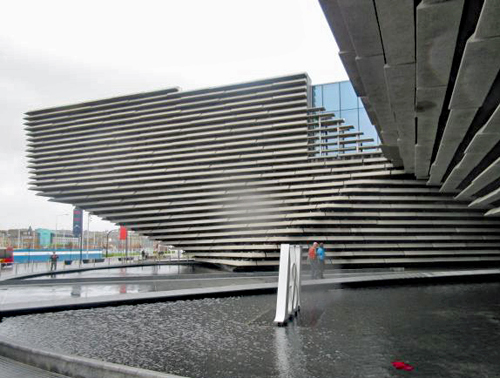 The inspiration for V&A Dundee came from conversations between Duncan of Jordanstone College and visitors to the city which highlighted its potential to provide a home for Britain's first design museum outside London. Japanese architect Kengo Kuma produced designs that were put to public consultation. Two inverted pyramids were to overhang the service spaces below, and the external appearance was likened to either the prow of a ship setting sail or else to windswept battered cliffs of Scotland's north-east coast with an axis pointing straight to the heart of the city. The consultation heightened public interest, and one consequence was to shift the location inland, its seagoing appearance retained by setting it in ponds so that instead of setting sail it now seems to be dipping a toe into the Firth. So as to break up the building's monolithic appearance concrete was poured into moulds supported by steel bars, with the lift shafts also embedded into the structure. Each concrete panel is slightly different so as to naturalise its look, and quartz gives a glow. Construction using a coffer dam filled with stones was timed to avoid the seal-breeding season, and a concrete skirt helped future-proof against flooding. Computerised design helped to smooth conceptualisation in space, with rectangular markings to highlight key locations, and the outline curves in many directions. If laid end to end, the panels would stretch from Dundee to Monifieth, while the piles are the length of the Tay Road Bridge. Main contractor BAM Nuttall worked with project manager Arup supported by local subcontractors and by a Glamis-based architect. Kuma was inspired by Scottish designers including Charles Rennie Mackintosh who in turn had drawn inspiration from Japan. The horizons are bounded by Broughty Castle, the hills of north Fife and the Tay Rail Bridge, while other new buildings and the new Slessor Gardens help provide the landward setting, with Discovery Point just next door. Fossils thirty-five million years old are contained in the limestone that makes up the floor of what he intends to be a "living room for the city", with timber panels providing a welcoming atmosphere that is more on a human scale than the exterior and also provides good acoustics. A time capsule contains relics from the present era, and a board lists donors including, poignantly, Michelin who have since announced closure of their Dundee factory with the loss of 800 jobs. The two pyramids provide a contemporary echo of the lost Dundee Arch, and mussels in resin form the cafe tabletops. A heat exchanger recycles hot air, and the floors provide flexibility for cabling to be run underneath. Opened on 15 September 2018, the impact of the V&A can already be felt not only in numbers of people visiting Dundee but also in new networking opportunities between design professionals, including the designers of computer games for which the city is justly famed. V&A Dundee contains a permanent exhibition of Scottish design incorporating the Oak Room from a Rennie Mackintosh tearoom, and also accommodates guest exhibitions. The first, running to 24 February, is about the speed and style of the Ocean Liner. With the emergence of mass air travel in the 1960s, all passenger business was lost to the skies, and the cruise-ships that take increasing numbers to sea are designed for providing holidays afloat, rather than a means of reaching a destination. The great age of ocean travel has thus long since passed, but the ocean liner remains one of the most admired symbols of modernity. No other form of transport was so romantic or so remarkable. Liners shaped the world in many ways - transporting millions of immigrants to new lives, servicing empires round the globe and carrying troops to war, while shipbuilding became central to many modern industrial economies. As nations competed for the coveted Blue Riband, awarded for the fastest transatlantic crossing, liner design became a matter of national prestige and an arena for the larger dynamics of global competition. But for many people, travelling on liners embodied the most visceral experience of the modern world. The primary business of liners was migration until 1920 when the US imposed controls. Thereafter the shipping companies rapidly turned their attention to wealthy people travelling on business or holiday, the latter often migrants returning to their roots. There was much more mixing of the sexes, cuisine became more international and at a design exhibition in 1925 where other countries declined to take part the French played a blinder by launching art deco as the ultimate style. Liners carrying administrators to the colonies had a less exuberant atmosphere than those on say transatlantic routes, and until the 1930s a suntan was associated with outdoor manual work. Therefore swimming pools were traditionally indoors prior to the postwar days when a tan was to become associated with the jetset. Passenger liner ioperators cultivated an image of immaculate service, often delivered by young lads whose impeccable appearance as bellboys might belie their humble origins. Funnels were seen as symbolic of a ship's power and strength, even though they might do little for its performance and integrity. Four funnels were not enough to save the Titanic, and the third funnel on the Normandie was purely decorative. A well-designed hull could combine beauty and speed: riveted ones had a shorter life than the welded ones used on ships today. While the Normandie was being converted to a troopship in New York in 1942, she was destroyed by fire, but fortunately many of her fittings had been removed and thus survive. These include a giant bronze panel of athletic human forms that are symptomatic of a 1930s concern with fitness driven by the twin pressures of poverty and of political extremism. The Italian fleet was destroyed in the Second World War, providing an opportunity to build new liners reflecting the resurgence of the country's design skills. The Americans were jealous of the Queens' greater speed, and after a major fire became focused on proofing against that possibility. Both Queens survived the war to give many years of further service, and while the Queen Elizabeth too was lost to a fire in Hong Kong the Queen Mary was acquired by the Californian city of Long Beach and can be seen there to this day as a floating hotel and museum. The last of the Cunard liners, the Queen Elizabeth 2, built like the earlier Queens with a government loan, showcased the work of leading British designers like Bernat Klein and survived the transition to cruising, but her fine 1960s features were ripped out after twenty years in accordance with the nation's retro mood and a desire to increase commercial returns from retail and gambling so as to hold down fares. The withdrawal of the France in 1974 happened in response to Prime Minister Giscard's decision to switch its subsidy of operating costs to Concorde. The Scottish Region thanks Ruth Lonsdale and Vivienne Low for the guided tours of the building and Professor Bruce Peter, who assisted in curating Ocean Liners: Speed and Style, for showing us round the Ocean Liners exhibition. We are also grateful to Lauren Elliott for coming up from HQ to join us.